Industry professionals weigh in on the discipline's growth and how to get impactful, sustainable programs off the ground. EMRs, health information exchange, enterprise data warehouses, data analytics—there are many evolving health care initiatives that rely on IT and the right strategies to support them. Consequently, today's hospital and health system C-suites must actively participate and monitor their strategies to extract the greatest value from IT investments. For these reasons and more, the informatics field is expanding rapidly across the health care sector. The US Department of Labor predicts 22% job growth in health information from 2012 to 2022 as health care organizations recognize the need for informatics expertise and the establishment of formal department structures. Brian Levy, MD, a consultant and informatics professional with more than two decades in the field, points to meaningful use (MU) as one catalyst that has set this growth trajectory into motion. "Now that hospitals have adopted EMRs, they need people who understand how these systems work and how we get clinicians to use them. Hospitals recognize they need to have this expertise available," he says, pointing out that the evolution of informatics increasingly extends beyond this purpose to encompass optimization and use of the data now residing in EMRs. "Now that we have all this data, how do we use it?" Sam Bagchi, MD, chief medical officer and chief medical information officer for CHRISTUS Health, says informatics is progressing from a more research-oriented function to an "operationally integrated improvement engine" to drive outcomes performance rather than a role that simply advises on technology-enabled best practices. "Informatics teams are key to realizing the full return of the immense investment in clinical technology that was deployed during the MU era," he explains. "Clinical technology was slammed into clinical workflows, and while many systems are MU compliant, they are not delivering the full benefits of safety, automation, and efficiency that were promised by EMR vendors." As with any medical discipline, Peter Embi, MD, MS, FACP, FACMI, president and CEO of the Regenstrief Institute, says there is a research and academic component and an applied and operational component to informatics. "Clearly the applied and operational component has been evolving for some time. We increasingly have groups in hospitals and health systems focused on what's called informatics, and that tends to encompass a number of different things that often gets to a sufficient size where a department is appropriate," he says. "Increasingly, we have these needs to analyze our data and make data-driven decisions about how we care for our populations and manage the enterprise. Some organizations may achieve that through partnerships with other entities or may have third parties come in and help with analytics needs. But invariably, internally, there are people charged with looking at the information and effecting decisions for the enterprise." AMIA defines clinical informatics as the "science of how to use data, information, and knowledge to improve human health and the delivery of health care services." More broadly, Levy defines informatics as "the use of information technology in health care," noting that a professional does not need to be a clinician to be an informaticist. "A subset of us are, but certainly there are lots of folks who are not," he says. The informatics field covers a wide range of skills and functions, everything from clinical documentation and provider order entry systems to system design, implementation, and adoption issues. Other key related areas include translational bioinformatics, clinical research informatics, consumer health informatics, and public health informatics. While a foundational industry definition exists, informatics professionals agree that the parameters of what defines a formal department are still developing. "There is a shift away from project implementation toward evidence-based content and functionality governance. Furthermore, there is an extraordinary backlog of optimization needs in most clinics and hospitals," Bagchi says. "Many departments were built around project implementation and not optimization work. Many high-performing informatics shops are now developing a discipline around optimization activity and are working toward better use of the systems that have been deployed." Embi believes a consensus definition will become clearer in time. "Those of us who call ourselves informaticians or who practice informatics recognize that informatics is a field concerned with how you optimize use of information in health care. That involves a lot of different approaches and techniques," he says. Some of these techniques include the use of technology, computation, and workflow analysis (getting the right information to the right person at the right time to make the right decision); human interface and information interpretation; and how information is used to impact quality, safety, and health care improvement. While the role of informatics varies by organization, the bottom line, according to Bagchi, is that all health care organizations can benefit from its use. "Every health system or clinic that has deployed or will deploy clinical technology should support the discipline and organizational function of clinical informatics," he says. "Bringing clinical insights to the existing technology team can support a more complete clinical process improvement that physicians and nurses expect to see with a new technology that impacts workflow." While larger systems often have greater resources to bolster informatics efforts, Bagchi emphasizes that small clinics and hospitals are still expected to invest and optimize their technology investments in support of federal HIT initiatives. 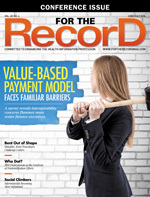 "Given the MU penalties that are still in play for hospitals and physician practices, every hospital and clinic must support these efforts with some sort of informatics discipline," he says. The focus of an informatics department will vary by hospital, Levy says. For instance, large academic centers will use informatics expertise for research initiatives, and, much like any clinical trial, professionals will focus on such tasks as applying for grants and identifying appropriate research initiatives to extract the greatest value from HIT. In contrast, large health systems will likely focus efforts around performance improvement, drilling deeper into high-level data analytics initiatives such as population health and cost containment. Pointing out that health systems will typically have a large data warehouse collecting data from EMRs, claims data, and other sources, Levy explains, "they need people to understand it, look at the data for research or outcomes purposes." Informatics in small community hospitals often looks much different. Levy notes that those overseeing informatics initiatives in those settings may not have formal training and may focus much of their time on the nuances of operationalizing IT projects such as order set design, deployment, and adoption. "For a small hospital, it's much more of a practical role, and I think it's much more focused on EMRs," he says. "For instance, getting order sets into EMRs and being a liaison to clinicians and docs, or if physicians complain about how a screen looks on the EMR, they can bring it to the informatics professional." When laying out the structure of an informatics department or initiative, health care organizations should start with the end goal in mind, Levy advises. He suggests first determining the primary focus areas for informatics—for instance, will the approach be pragmatic and practical involving use and function of EMRs or will oversight extend into greater analytics or research initiatives? Once these determinations are made, Levy says an organization then needs to identify whether it will seek out a trained informatician. And while trained or certified professionals are not always easy to come by, Embi says this consideration is an important one. "One of the things to recognize is that there is a field of informatics, and it is a distinct discipline. There are board-certified professionals, highly trained professionals who are trained in the field of informatics. A good place to start would be to have an actual informatician running a department," he says. With an effective leader embedded in the organization, Embi says health care organizations should integrate that expert into the core leadership team—essentially "putting that professional at the table where the strategic decisions are being made." Bagchi notes that forward-looking informatics programs must evolve to encompass a mission of improving outcomes for both patients and communities. Because many programs were built in response to MU and other regulatory requirements, he suggests reengineering the design and function of informatics to address tangible outcomes that matter to patients and caregivers. "These programs are most effective when they are chartered with support from the enterprise CEO. Ultimately the program should fit within the span of control of clinical executives," Bagchi says. "Even outside of MU penalties, genuine clinical and business cases must be and can be developed for the value of the investments in a high-performing informatics department." Overall, Embi believes the industry has made significant strides over the past decade in terms of maturing the role of informatics. "We now have a lot of raw materials and technologies that have been pretty well established. That has put us in a position to have an abundance of data to be leveraged," he says. "Now that we've got it, how do we really start to use it to benefit more people? We have a way to go before we are where we want to be in that regard. There are pockets of maturity." The 2018 HIMSS Leadership and Workforce Survey confirmed industry expectations of continued growth in the informatics field. The survey of 369 health information and technology leaders revealed that 61% of vendors and hospitals had open positions in health care and information. Additionally, 75% of vendors and 40% of hospitals expected to increase their HIT workforce in 2018. Other industry statistics, such as those from the US Department of Labor's Bureau of Labor Statistics, also point to broad growth, suggesting that there is significant variety and opportunity in the field of informatics moving forward. While physicians can now become board certified in informatics, Brian Levy, MD, a consultant and informatics professional with more than two decades in the field, emphasizes that informatics professionals do not have to be clinicians to work in health care. "At AHIMA, they made an active push over the last few years [with informatics] as they realize that in the future, the industry is probably going to need fewer coders," he says. • a master's degree in health informatics from an accredited health informatics program. Many formal informatics programs exist across the country. AMIA offers a list at www.amia.org/education/programs-and-courses.